SLIP ’N SLIDE – A local curler works on her form during a training session prior to the Curl for Kids’ Sake on Sunday. The event raised more than $11,000 for BBBS Yukon. Local curling action has ramped up in a hurry. Last Sunday, the first major event of the Whitehorse Curling Club season saw $11,511 raised for Big Brothers Big Sisters (BBBS) Yukon via the Curl for Kids’ Sake. Fifteen teams and more than 60 curlers participated in the event, which included an intermission featuring a pizza lunch and live auction. BBBS Yukon executive director Shelby Maunder thanked all of the curlers who contributed to the cause. 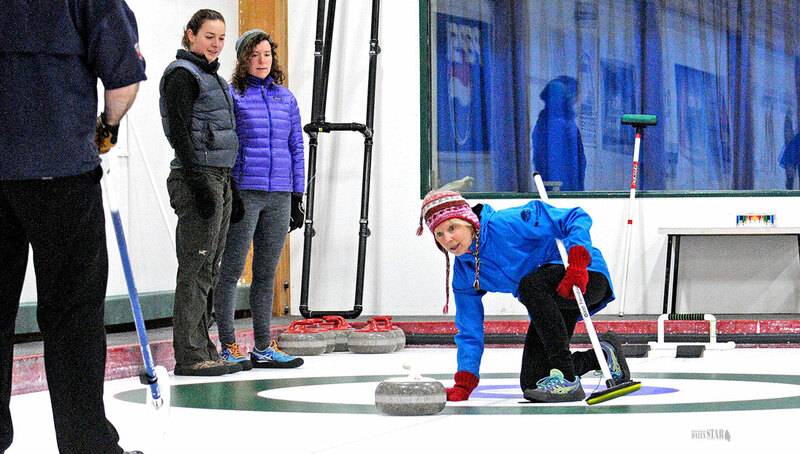 “Their efforts, combined with generous sponsorship from various local businesses, made our annual Curl for Kids’ Sake event another success,” Maunder said. “The proceeds from the event help us to continue offering and expanding our mentoring programs,” Maunder added, noting BBBS is always humbled by the support and generosity of the community. Last year’s event raised $8,500. Meanwhile, two Whitehorse rinks spent last weekend competing in Fairbanks, Alaska, at the 2015 Yukon Title Classic held Nov. 5 to 8. Team Cathway Water Resources, led by skip Pat Paslawski, lost the championship final 4-2 to Seattle-based Team Sieg, captained by reigning world curling senior champion Lyle Sieg. Paslawski’s rink earned $1,600 for the second-place finish. Team Wallingham, led by Walter Wallingham, lost in the quarter-final of the A playoff bracket, earning $400. Paslawski’s team also included third Richard Weihers, second Tyler Williams and lead Trent Derkatch. Wallingham was joined by third Herb Balsam, second Ed Kormendy and lead Don Duncan, finishing 3-2. Paslawski’s rink finished first in their pool with a 4-2 record, with both losses coming at the hands of Sieg. The rink earned a bye into the semifinal after winning the draw-to-the-button competition with a tournament-low total of 41.5 inches. All four players threw rocks. Tonight, the EBA Tetra Tech Mixed Bonspiel kicks off in Whitehorse, with the first draw getting underway at 9 p.m. Twelve teams are registered for the tournament.